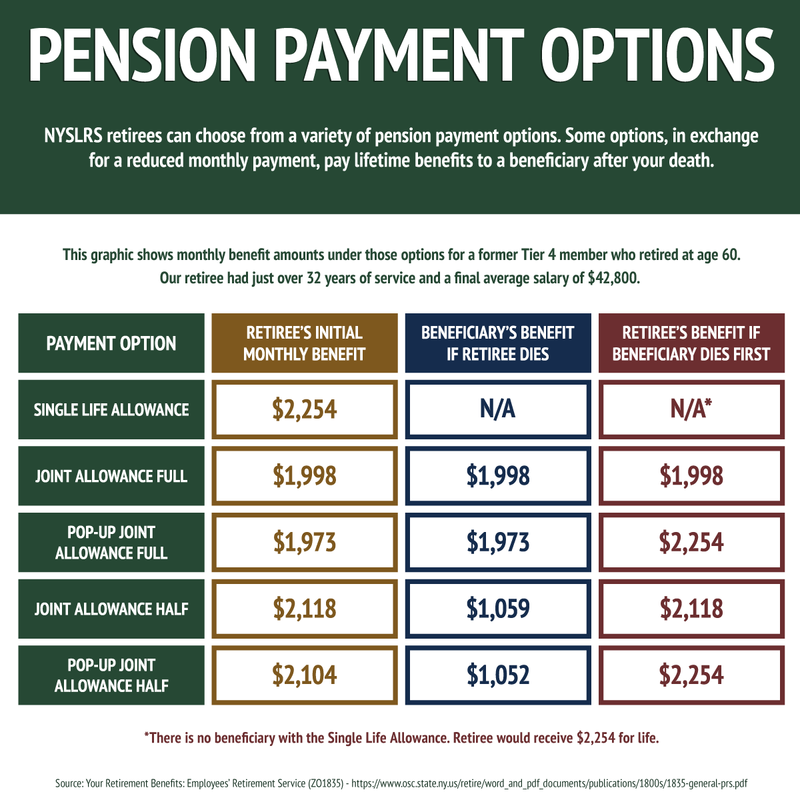 When you apply for a NYSLRS pension, you’ll be asked to pick a pension payment option. All options will provide you with a monthly benefit for the rest of your life. With the Single Life Allowance, all payments stop at your death and nothing is paid to a beneficiary. If you’re married and need to provide for your spouse, or if you have someone else you would like to provide a lifetime pension for after you’re gone, there are payment options that let you do that. In exchange for a reduction in your monthly payment, Joint Allowance options allow a beneficiary to collect all or part of your pension after you die. The amount of the reduction in your pension is based on your life expectancy and the life expectancy of your beneficiary. That means the younger your beneficiary, the deeper the reduction. You can only choose one beneficiary under a Joint Allowance option, and your beneficiary selection cannot be changed after you retire, regardless of the circumstances. The benefit reduction for Joint Allowance options will continue even if your beneficiary dies before you do. The monthly reduction in your benefit will be greater if you choose a Pop-Up option over a regular Joint Allowance. There are also options that allow you to leave a monthly payment to more than one beneficiary, and options that leave a benefit for a certain amount of time. Visit our Payment Option Descriptions page for details about all of the available payment options. 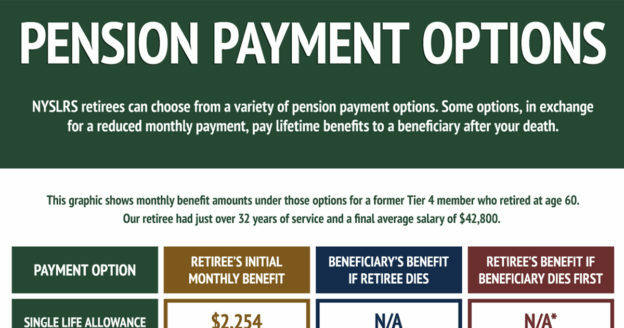 For a better idea of how these payments options would work out for you and your beneficiary, you can use our online pension projection calculator. It uses the information you enter to show how much you could expect to receive under each option. Most members who are within five years of retirement eligibility can also request a benefit projection by contacting our Call Center at 1-866-805-0990, or you can submit a Request for Estimate form (RS6030). Content last revised September 19, 2018. This entry was posted in Members and tagged beneficiaries, beneficiary, benefits, Employees Retirement System, ERS, joint allowance, know your benefits, members, New York State & Local Retirement System, NYSLRS, NYSLRS pension, pension payment options, PFRS, police and fire retirement system, Preparing to Retire, retirement, Single-Life Allowance on September 19, 2018 by NYSLRS.